Learners love learning by playing games. Learners love learning by playing games. It gives them a great opportunity to produce the focused grammar point by playing a challenging game. 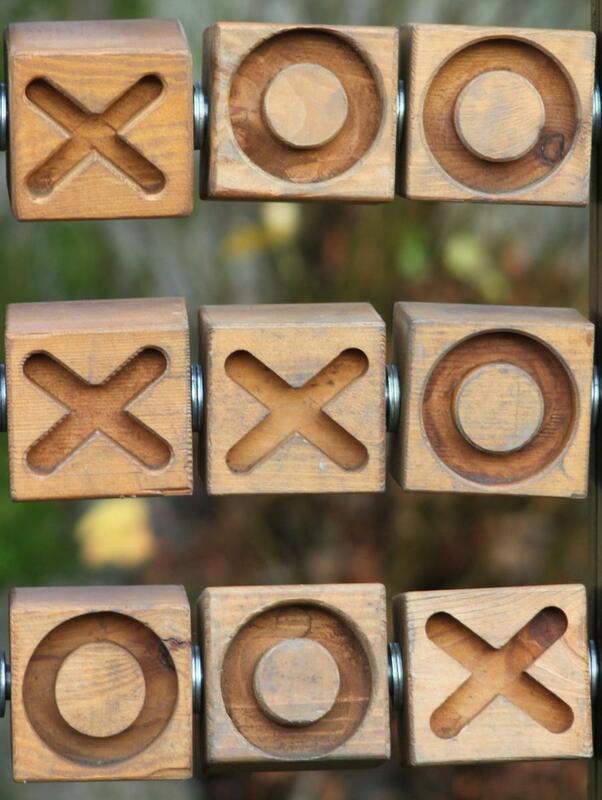 Noughts and crosses or tic-tac-toe games are one of the simplest games that you can easily adapt to language learning classes. They bring fun and really change the dull atmosphere of the lesson in a second. I usually use them for revising a previous lesson, and they work great. Besides, they can engage the attention of any age of learners. It's not only a child's game. Here are six different ways to implement Noughts and crosses game into EFL lessons. This is my favourite one and the one I use most often. I strongly suggest implementing this game into grammar lessons because they work like a charm. It’s easy to set-up, and it can go with any grammar concept perfectly. There may be many variations, but briefly, it’s just putting words into the grid and then asking them to produce the target grammar point in a meaningful sentence. Tell the class that they’ll play noughts and crosses. You can try eliciting how to play the game or just say they’ll need to make three horizontal, vertical or diagonal boxes of noughts or crosses to win this game. Draw a grid with nine boxes on the board. 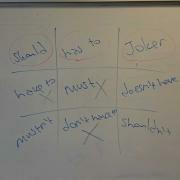 Put the nine modal verbs into the boxes of the grid. You can put must, mustn’t, have to, don’t have to, should, shouldn’t. Then, you’ll have six in total. I suggest adding these: doesn’t have to, has to and a joker which will be filled with any suitable modal verb. Allow a few minutes to make meaningful sentences with the modal verbs alone. This is a critical stage if you want to have a more dynamic game. They probably won’t say their sentences quickly on the board unless they have prepared them in advance. Choose two players. You can also make groups of players, which will be more convenient for large classes. Toss a coin to find the first player in the game. This is also a crucial stage if you want to have a fair game. Tell the first player to produce a proper sentence with a modal verb in the grid and get a chance to put noughts or crosses on the grid. Ask them to explain their rationale behind their sentences. If it’s OK, then they can put a nought or cross on the grid. The winner is the player who has achieved to produce three noughts or crosses adjacent to each other horizontally, vertically or diagonally. I strongly suggest assigning the class as the jury of the game. They check if the produced sentences are correct or not during the game. In this way, you’ll help the whole class to participate in a small game like this with a limited number of players. You can revise any vocabulary topic with noughts and crosses. The procedure is straightforward. First, choose a vocabulary topic. Then, elicit any word from the set of a specific vocabulary theme from the class and put them into the grids. The rest is more or less the same as a grammar revision game. The players have to make a proper sentence with the selected words or phrases in the grids and also have to make a simple definition of the word. Let's say if you have chosen electronic gadgets as a vocabulary theme, then you may have satnav word in one of the boxes. The student may say "I can’t find my way without a satnav." “It helps us to find our way.” If the answer is acceptable, then the students mark the word with a nought or cross. Again, I strongly advise you allow them a few minutes to prepare their sentences before the game. Otherwise, you might wait a bit longer for the answers, and the game will become a time–consuming activity. If you want to revise only one tense, then just put some different subjects or personal pronouns and try to elicit a sentence with the chosen subject in a meaningful grammatically correct sentence. For example, if you want to revise present simple tense, then write my best friend, my aunts, Tom along with six personal pronouns into the grids. If you feel your class is good with personal pronouns, you can have different subjects such as our team, nobody, Mary and Angela or your desk mate into the grids. I > I play bowling at the weekends. My best friend > my best friend likes pizza a lot. If you want to contrast to tenses, you can give some time expressions of the two tenses and then the players need to make proper sentences with those expressions. This week > I'm studying for my exam this week. Every Saturday > we go fishing every Saturday. You can make spelling revision of almost anything. Just give the base form and ask the desired form of the word. When eliciting, don't forget to ask the spelling of the answer. Write base forms of some adjectives and elicit the comparative or superlative forms of them. Write the base forms of regular or irregular verbs and try to get any form of them. You can draw pictures or put photos of any vocabulary and ask what they are. If you put pictures of some actions, you can ask your students to make proper sentences using the action in the picture. If you put the pictures of some free time activities, you can ask how often they do the activity and make a sentence with it. It would be a good idea to ask them to give true sentences. You can have a much more interesting lesson in this way. For functional language revision, you can write some phrases ask where the students might use that phrase. Also, you can write the place and ask the specific phrases that would be useful there. "I'd like some soda, please. > in a restaurant or cafe. How do you do? > In a business meeting or in formal places when you meet with someone for the first time. There may be many other ways to use this game in your classes. Just use your imagination to turn your revision lesson into fun time with this game. There is noughts and crosses game template below. If your students like the game on board, then you can download it and let students play it in pairs.